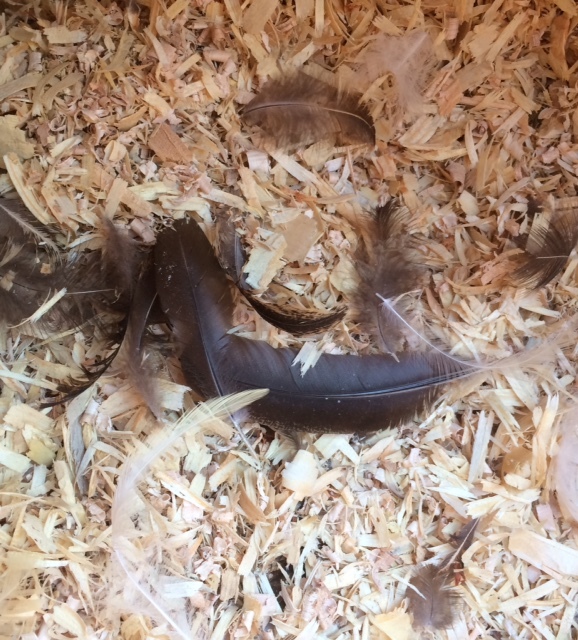 Homestead Bounty Blessings: It's Molting Time! It's molting time again. If you have chickens then you know what I mean. It kinda looks like the chickens had a pillow fight overnight! I often think it looks like my chicken sneezed real hard and just blew all their feathers out. I had a few of my Copper Marans molt over the summer but most of the others seem to be molting now. It is the usual time mine molt. I also tend to have a few that molt in the dead of winter which I think is absolutely crazy! I hope no one molts over the winter this time. I get so worried about them being able to stay warm enough. It's a good idea to increase their protein intake when they are molting. It's hard work and takes a lot out of them. If your hens seem a little crankier than normal it could be due to the molt. It is uncomfortable and even painful when the feathers start coming in. It's a good idea to not handle them too much during this time. Their feathers will come in quick enough and things will be back to normal soon. I really like when some of my poor barebacked hens get to be beautiful again with a full body of fluffy feathers. It's perfect preparation for the upcoming winter. I am looking forward to cooler weather (just wish it didn't have to snow!). How is your flock doing? Do you have any heavy molters? What special treats do you feed your chickens during this time?